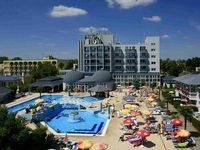 Location: Hotel Silver****superior is located in Hajdúszoboszló, in the resort quarters of the spa in East-Hungary, world famous for its medicinal water, next to the Town Bath (Városi Fürdő) and Aquapark. The town of Hajdúszoboszló is located on the outskirts of the renowned Hortobágyi Puszta, 202 km from Budapest, and 20 km from Debrecen. Accessibility: In terms of transport links, the town's position is very favourable: it can be reached from Budapest either via the M3 motorway or via the No.4-main road or by Road 33. It is also favourably positioned for rail transport: it lies on the Budapest - Szolnok - Debrecen - Nyíregyháza - Záhony main line; both Inter-City and Tisza-express trains stop at Hajdúszoboszló. If requested, transfers can also be provided. The Hotel: The hotel consists of two buildings (Főépület - Main Building , and Új épület - New Building), located opposite each other on either side of the Mátyás király sétány. The hotel boasts 170 air-conditioned rooms. The New Building houses the reception and information service, with check-in and check-out at the reception of the Main Building. Check-in on the day of arrival is at 14.00, while check-out on the day of departure is at 11.00. The Main Building houses a restaurant, a drinks bar, a grill terrace and a water bar on the terrace, while the New Building offers a café and a pool beach bar. Please be aware there is no covered passageway between the two buildings. Meals are served in the restaurant of the Main Building. Both buildings have their own pool, and guests have access to both facilities. Both buildings have a wellness section, but therapies are available in the Therapies (Terápia) section of the Main Building. Catering: In February 2007, our hotel's restaurant was awarded the patronage plaque of the Hungarian National Gastronomy Association. Our hotel restaurant awaits guests with a variety of international and Hungarian dishes, but, upon request, low-calorie and other special diets can also be provided. On the beach terrace, international and Hungarian dishes are served, and the garden plays host to memorable barbeque parties. The main spectacle of the beach pool is the water bar, where our guests can unwind with their favourite cocktail while sitting on a bar stool sunk into the pool. Rooms: The basic equipment of the rooms includes a bathrobe, hairdryer, safe, stereo colour television with close to 60 channels (including English, German, Russian, Spanish and Italian channels), and the mini bar that satisfies all requirements. Almost all of the rooms have their own balcony. All rooms have air conditioning. Standard double rooms: Bathroom equipped with a shower and WC with a bidet. Double or single beds, with extra beds available for most rooms. Standard apartments: Two rooms, some with living rooms and bedrooms with a separate entrance, others have rooms that open into one but can also be used separately. Bathroom equipped with a shower and WC with a bidet. Superior double rooms: Bathroom equipped with a shower and WC with a bidet. In some rooms wired Internet access. Superior Apartments: Bathroom with its own shower as well as a WC with a bidet and a Jacuzzi. Wired Internet access. Motor-driven remote control Cardo bed mattress. Bio-comfort rooms: The rooms have been built in the two-storey wing behind the Main Building by the Beach pool. Here all rooms have a balcony and air-conditioning. The bathrooms come with a shower and a WC with a bidet. Some of the bio-comfort rooms have pine furniture. Two rooms with kitchens have been specifically built for people with disabilities. 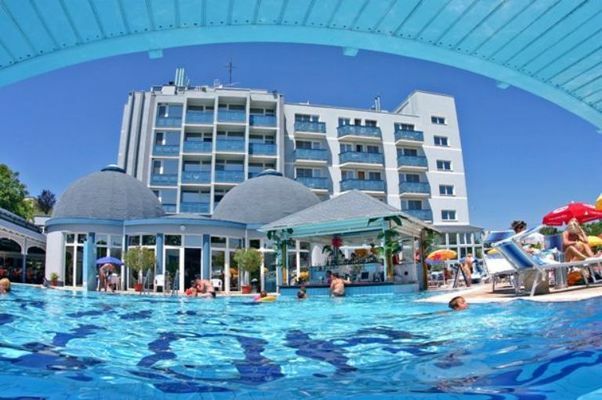 Services: The price of each room includes a bathrobe, a hairdryer, a safe, as well as access to the bath sections of both buildings: steam bath, sauna, infra sauna, hydro massage, Jacuzzi, indoor and outdoor thermal water pools, fitness gym, outdoor pools with fun equipment, and sunbeds. Additional services: playhouse sessions for children - if there is a sufficient number of interested kids, room service, therapies, vital massage, chiropractor, Swedish massage, body cosmetics, aroma therapy treatments, salt chamber, stylist, manicure, pedicure, beauty salon, solarium, slot machines, laundry, guarded car park, underground car park (closed car park operating with a camera and a card entry system). In the public rooms (hall, bar) there is wireless Internet access with a Hot-spot card that can be booked at Reception, as well as 2 coin-operated Internet Terminals. Our hotel accepts credit cards, holiday cheques, and health insurance. Silver therapy and wellness treatments: The qualified staff of our Therapies section await our guests who come here to heal or re-energize themselves or just to give themselves a beauty treatment with a wide range of massages, and therapeutic and wellness programme packages. Our hotel has its own therapeutic centre, thermal water pools (Jacuzzi, and hydro massage, with daily fresh thermal water top-ups). There are two indoor thermal water pools in the Main Building with a water temperature of 36-38 degrees, but there are also an indoor and an outdoor thermal pool with 37 degree water. In our Therapies section in the New Building our guests are spoilt with: detox treatment with mud from the Dead Sea, skin-firming treatments with goat's milk, aroma therapy treatments, and an oxygen bath. Also: in our Vital massage centre, avail yourselves of manual and mechanical massages based on Chinese traditions but also adapting to individual needs, the services of a chiropractor, ultratone treatment in our beauty salon, aroma therapy, rehabilitation and slimming treatments as well as Swedish sports and refreshing massage. Sports and Fitness: The inner yard of the Hotel boasts a pool with a water surface of 450 m2, with a separate 8.5 x 25 m section suitable for swimming and with a gradual rise, where different pieces of fun equipment (water mushroom, water knives, two-headed neck shower, two plashers, a water bar, night-time underwater illumination) can be found. By the pool sunbeds and parasols offer enjoyable relaxation to our guests. In the yard there is also a splasher for kids. In addition to the two thermal water pools, the New Building also houses a 400 m2 outdoor swimming pool. In the work-out room there are fitness and cardio machines. The hotel also offers facilities for table tennis, bowling, tennis and clay shooting in the vicinity of the hotel, and even angling, on our own lake. Conferences and programmes: The Main Building boasts a conference room for 80-100 people, while the "Silver I-III." conference room of the New Building can hold up to 200 people. The room is lit with natural light, but can be totally dimmed during projections. It can also be divided into three sections. Upon request, all technological solutions are available (lectern, sound amplification, overhead projector, screen, flip-charts, mobile microphones, laptop, presenter, TV, video, DVD player, etc.). For a smooth organization of events the hotel offers a staff of technicians. If necessary, a programme assistant helps the organizers in their work. The above premises make excellent venues for conferences, exhibitions, workshops and company or entertainment conventions. • Half board is available at 4800 HUF per person. • Garage is available for guests at 2000 HUF per car per day. • Children under 3 stay free in their parents' room.